A couple of weeks ago, Dustin published the first part of our Mobile Buyer’s Guide, focused on notebooks and desktop replacements larger than 14”. 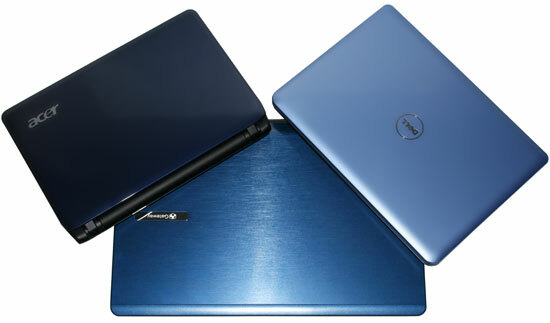 Now we’re back with the second half, detailing the best choices for portable and ultraportable notebooks and netbooks. With the back to school season approaching, newly refreshed notebooks are being released on a rapid fire basis. It’s pretty exciting, with tons of new products and new technology platforms hitting the market all at once. While a few months old, Intel’s Core i3/5/7 processors are really starting to ramp up, with standard voltage Core i3/i5/i7 processors essentially taking over the market. The delayed CULV refresh, with low voltage Arrandale chips, is also starting to hit the market in notebooks like the Alienware M11x R2 and Acer’s TimelineX series. Intel’s also done a bit of refresh job on the netbook-class Atom processor, with higher clock speeds, support for DDR3 memory, and a dual core variant expected to hit early Q3. AMD has its own updates in the pipeline, with tri and quad core Phenom II chips (Danube platform) launching in some of the larger notebooks and their 2010 Ultrathin platform, codenamed Nile, just starting to hit the market. Danube and Nile both share the RS880 chipset and SB820 southbridge, along with a 55nm Radeon HD 4225 integrated graphics chip built on the RV620 core. And on the graphics front, we’ve got ATI really making some waves with high performance DX11 parts like the HD 5850 and 5870, and on a more mainstream level, the HD 5650 as well. NVIDIA is dominating the portable market, with the Optimus automated graphics switching technology being a real draw for notebook manufacturers. On the higher end, NVIDIA just launched its first mobile DX11 part, based on a cut down version of the beastly Fermi core. More mainstream DX11 parts are in the pipeline for Q3 as well, based on even more scaled down variants of Fermi. And then there’s Next-Gen Ion (or Ion 2, whichever you prefer), which adds a discrete NVIDIA graphics chip and Optimus to Pine Trail based netbooks, making them serviceable HD media playback machines. We’re still waiting for NG ION to hit market (the Acer 532g just got canceled), but it’s supposed to be out this summer as well. With all of the major chip makers firing on all cylinders, the sheer amount of new laptops on the market is simply astounding. In fact, of the group of laptops mentioned in this guide, just a handful are more than two months old, and there are at least five that are still in the preorder stage, though due to ship in the very near future.